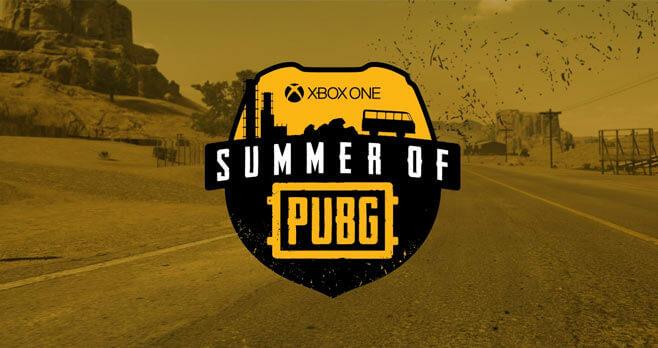 Microsoft is giving away a PUBG Bus customized by West Coast Customs with the Summer of PlayerUnknown’s Battlegrounds Sweepstakes. For your chance to win, visit summerofpubg.com and enter by September 3, 2018. A few other lucky winners will win a PUBG prize package or a copy of PLAYERUNKNOWN’S BATTLEGROUNDS. Eligibility: The Microsoft Summer of PlayerUnknown’s Battlegrounds Sweepstakes is only open to legal residents of the contiguous 48 United States (including the District of Columbia; excludes Alaska and Hawaii) who are 18 years of age or older at the time of entry. Promotion Period: The Sweepstakes begins at 12:01 a.m. PT on July 18, 2018, and ends at 11:59 p.m. PT on September 3, 2018. Limit: Limit one (1) entry via the online entry method; one (1) entry via the Twitter entry methods; and one (1) entry via the Instagram entry methods per person/authorized e-mail account holder/authorized Twitter/Instagram account holder, regardless of method of entry during the Sweepstakes Period. One (1) Grand Prize: One (1) custom-branded “PlayerUnknown’s Battleground” Bus. One (1) First Prizes: One (1) Samsung 55” Class QLED 4K television; one (1) Xbox One X console bundle; one (1) Xbox Elite Wireless Controller; one (1) 3-month Xbox Live Gold membership; and one (1) 3-month Xbox Game Pass membership. Ten (10) Second Prizes: One (1) Xbox Elite Wireless Controller and one (1) digital copy of “PlayerUnknown’s Battlegrounds” game preview edition for Xbox One.